News headlines are filled with stories about how certain segments of the society are routinely excluded from participation in activities which have been historically 'dominated' by adult white males - not unlike Santa's sleigh propulsion units banning poor Rudolph from join in any reindeer games. Not only have 'outsiders' been prevented from engagement, but, you would likely conclude based on the invective words that drip from the pens and/or mouths of those reporting, tireless campaigns have been mounted to see to it that exclusiveness continues. I will agree that there have been instances of preferential treatment by some groups and people, but I also know many attempts have been made over the decades to attract other than white males into all kinds of activities normally associated with white males. In fact, it is not a stretch to say many specialty groups go out of their way to make a big deal out of non-typical persons interested in joining. Model rocket, model boat, model aircraft, electronics, amateur astronomy, woodworking and many other magazines and organization are always sure to include coverage of women, colored people, handicapped people, youngsters, etc., at every opportunity. Often extensive efforts are made to recruit members of all stripes. I have seen it repeatedly over the decades. 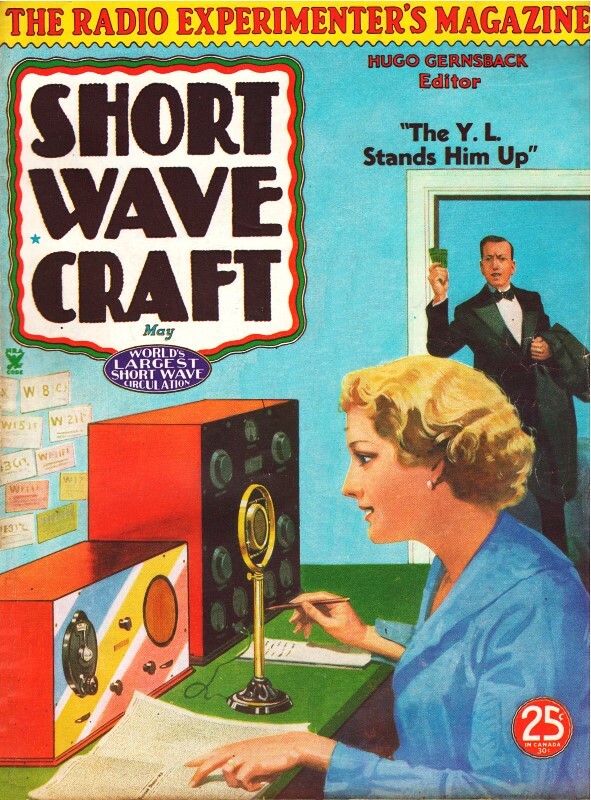 Here is one of many examples that appeared in a 1935 (yes, 1935) edition of Short Wave Craft where the editor, Hugo Gernsback, encouraged women and girls to get involved in amateur radio. Given the reality that so much effort has been put into active recruitment by private entities and monumental amounts of tax money has been spent by the government agencies to encourage other-than-white-males to take an interest in these hands-on activities of sport and craft hobbies, and that such a relatively small portion of the population has opted to participate, maybe the truth is they, as a whole, genuinely have no interest. What a radical, hate-filled thought that will be deemed by media agitators. 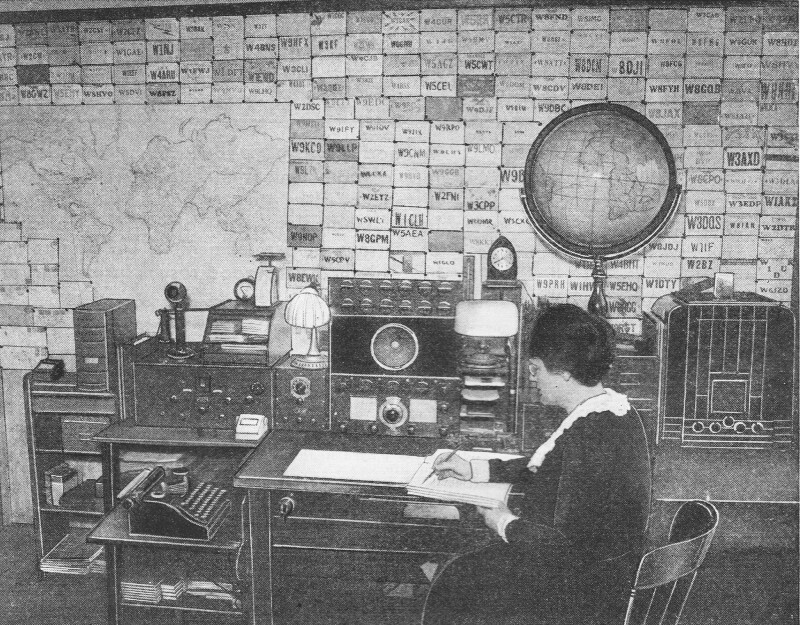 Hats off to Mrs. Alice R. Bourke, owner of this remarkable short-wave transmitting and receiving station, which she operates under Uncle Sam's license call - W9DXX .. Several well-known makes of short-wave receivers are to be seen in the photo. whose station appears above, has what appears to be possibly the finest "XYL" station in the country. The transmitter used at W9DXX is not shown in the above photo, but for the benefit of our Ham friends, we may say that it is crystal-controlled, uses a 47 oscillator, 801 doublet, 203-A buffer, and a pair of 203 A's, push-pull in the final amplifier, with an input of 450 watts on 40 meters. Signals from this station have been heard in Poland and Russia. The operator of station W9DXX handles regular message "traffic" and likes to hear from other amateur short-wave station operators. 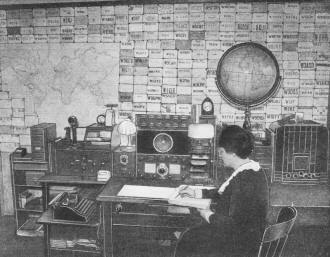 Mrs. Bourke is a member of the A.R.R.L., the Anglo-American Radio and Television Society, Réseau BeIge, and other radio societies, besides being the only XYL member of the Society of Wireless Pioneers. The owner of W9DXX has been connected with the Chicago newspaper world for a number of years and she has had some very interesting and exciting experiences as a police reporter for the Chicago Tribune . We are sure that this excellent photo of Mrs. Bourke and her station will inspire other YLs both in this country and abroad to send in to the editors a good photo of themselves and particularly of their station. Please keep in mind that the photos must be as clear and sharp as possible, and at least 4 by 5 inches, but preferably 5 by 7 inches or larger. We can use separate photos of the operators where they do not appear with the station apparatus. In any event, be sure that the photo is good and clear and as large as possible, and send this along with a short description of three hundred to five hundred words, preferably typewritten, describing briefly the apparatus used and also schedules maintained and what countries the operator has had contact with. YLs and XYLs are all eligible in this contest for the best photo and the editors will be anxiously awaiting for the coming mail to see what our lady "Ham" operators have been doing. Let's go! There are many fine amateur short-wave transmitting stations operated by "YL" (young lady) operators; married women add one more initial and are known to the short-wave fraternity as "XYL's." The editors are offering a $5.00 prize for the best photo of the licensed lady amateur operator and her station and the opinion of the judges will be final. The deadline for photo entries for the next issue will be April 20. In the event of a tie, equal prizes will be given to both. Send entries to "YL" Photo Editor, W2AMN; c/o Short Wave Craft, 99-101 Hudson St., N. Y. City.